Wow! 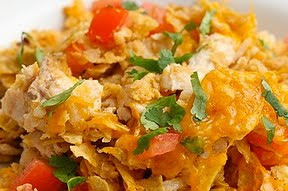 This was a good recipe...Chicken Tortilla Casserole. Everyone loved it, it made enough for two nights, warmed up great the next day for leftovers, and was pretty easy...I'd call this a 'win-win' (win-win-win if you a fan of "The Office"). I did make a few changes to make it even easier for me and have denoted those in blue below. Pat the chicken breast halves dry and season with salt and pepper. Heat 1 tablespoon of the vegetable oil in a 10-12 inch oven-safe skillet over medium-high heat. Add the chicken to the pan and cook until golden brown on both sides (chicken does not need to be fully cooked at this point.) Transfer to a plate and set aside. I just sauteed my chicken pieces and went on with the next step. I didn't even bother to remove them to a plate. Stir in half of the tortilla chips. Nestle the chicken into the broth and cook over medium-low heat until cooked through (reading 160° F on an instant-read thermometer), about 10 minutes. Transfer the cooked chicken pieces to a cutting board and shred into bite-sized pieces when it is cool enough to handle. Because my chicken is already cut up, shredding isn't needed nor is removing it from the pan and cooling it. *borrowed this image from Annie's Eat because we were too hungry and excited to stand it any longer...we dove in!